On a clear night, you can see the planet Jupiter with nothing more than your eyes, as it shines steady and bright against the background of glittering stars. If you take a closer look through a telescope, you can see tiny specks surrounding it. What if I told you that there may be life on one of these specks? NASA is about to embark on a mission to explore yet another unexplained part of the solar system. This search is spurred by the existence of a massive, ice-covered, water world type moon, which could very possibly be the home of a plethora of extraterrestrial aquatic life. This intriguing moon, filled with so much possibility, belongs to Jupiter and its name is Europa. It is finally time to find out exactly what is happening on this moon. NASA announced earlier last year that they are going forth with a mission to this icy world with high potential for housing life. According to Dr. Curt Niebur, program scientist on the Europa mission, there is an urban legend that back in the 1990s at a science conference, a video conference was held with 2001: A Space Odyssey author Arthur C. Clarke himself, who gave NASA his permission to land on Europa, despite his original warning to avoid an attempt. Europa is one of four large moons discovered by the astronomer Galileo, four hundred years ago. Today, we now know that under its many miles of icy crust, there may exist an environment highly conducive to supporting some form of life. Just like our own Moon, as Europa orbits its planet, it undergoes tidal flexing. This makes it flex and stretch. As this occurs, it warms the interior of Europa with the heat it creates. It is possible that this action may be responsible for volcanic activity occurring – similar to the activity on another one of the Galilean moons – Io. The idea behind the mission is to complete an assessment of Europa and inspect its potential for harboring life. This mission concept is now going into phase known as formulation – otherwise known as the development phase. Here is how it will happen. In the 2020s, a spacecraft loaded with instruments and tools to conduct experiments will launch on a 6.5 year expedition heading towards planet Jupiter. Every two weeks, the satellite will travel around Jupiter, offering it numerous chances to perform up-close flybys past Europa. The team has planned for this to happen 45 times, at distances ranging from 1700 miles (2700 kilometers) to 16 miles (25 kilometers) away from the surface, so that the spacecraft can collect high-resolution images. The responsibility of project management will fall on NASA’s Jet Propulsion Laboratory, where a team has been collaborating with the John Hopkins University Applied Physics Laboratory (APL) to study the mission concept of the spacecraft taking multiple passes of the moon. 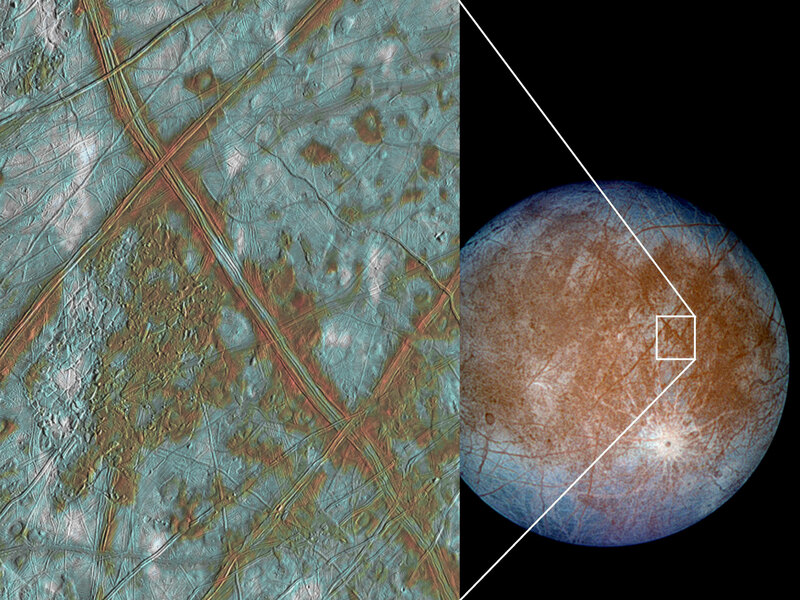 Nine instruments have been chosen to hitch a ride on the satellite sent to Europa. Scientists will learn about the composition of the surface when cameras and spectrometers snap high-resolution photos and send them back for analysis. A radar will be utilized to penetrate the icy shell to measure its thickness and determine if lakes, comparable to those that reside underneath Antarctica’s ice sheet, exist underneath it. 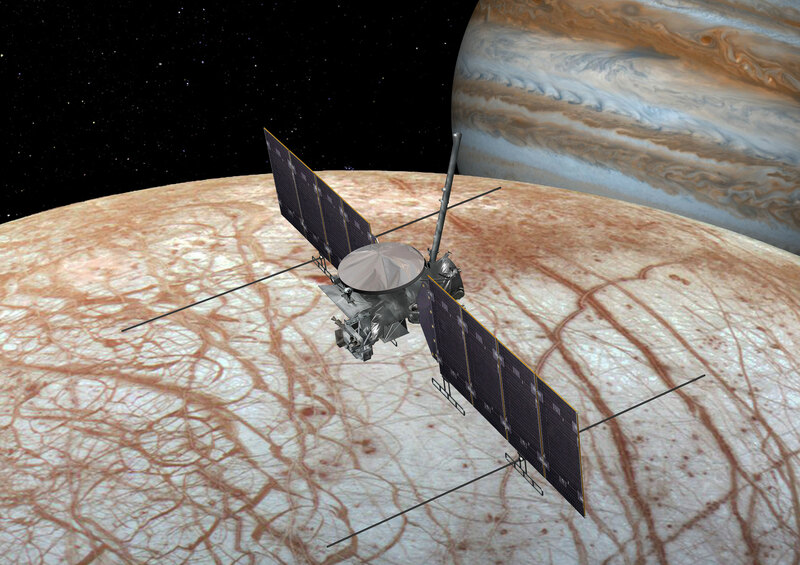 The strength and direction of Europa’s magnetic field will be measured by a magnetometer to figure out the depth and salinity of the subsurface ocean. Other instruments on board will look for confirmation of water and small particles in the atmosphere of the moon. In 2012, the Hubble Space Telescope made a notable discovery of water vapor above the southern polar region of Europa, which could possibly be evidence of the existence of water plumes. If this is proven true, studying their composition could provide clues to the possibly life-sheltering environment’s chemical makeup, making it less necessary to drill into the thick crust to find out. Information gained from this mission (which has yet to be officially named, but informally is called “Clipper” by those working on it) could eventually lead to the creation of further pursuits. When asked if a lander is included in the plans, Dr. Niebur stated, “We are studying a lander. Our analysis shows that it makes the most sense to launch it about 2 years after Clipper is launched. We currently have a Science Definition Team working on finalizing the scientific goals of the lander, but its primary objective will be to search for evidence of life. It will land, use a drill of some kind to collect ice samples, and then deliver the samples to science instruments for analysis.” Science instruments for the lander have not yet been chosen. What exactly will NASA find when it starts to examine all of the mystery surrounding this world? That is yet to be answered, but if speculation proves to be truth, discoveries made about Europa could force us to come to terms with the existence of life outside of Earth. What do you think that life look like? Will it be plant or animal? How would Jupiter appear in the sky when looking up from Europa’s surface? “Europa is tidally locked, meaning the same side of Europa always faces Jupiter (like Earth’s moon). If we land on the side of Europa facing Jupiter, then I promise you we will have pictures of Jupiter hanging above Europa’s landscape. And Jupiter would be about 20 x larger than the Earth’s moon looks from the surface of Earth.”, says Dr. Niebur. This little, intriguing moon could hold one of the most poignant discoveries of our lifetime. With such irresistible potential, even Arthur C. Clarke had to make an exception to his famous ban on attempting a landing there.